When you type “how to automate…” in Google search box, one of the first search suggestions says “how to automate the boring stuff”. Indeed – the boring stuff, repetitive, arduous, but necessary tasks are the burden that we wish to get rid off with help of some magic tricks. The same applies to marketing activities. 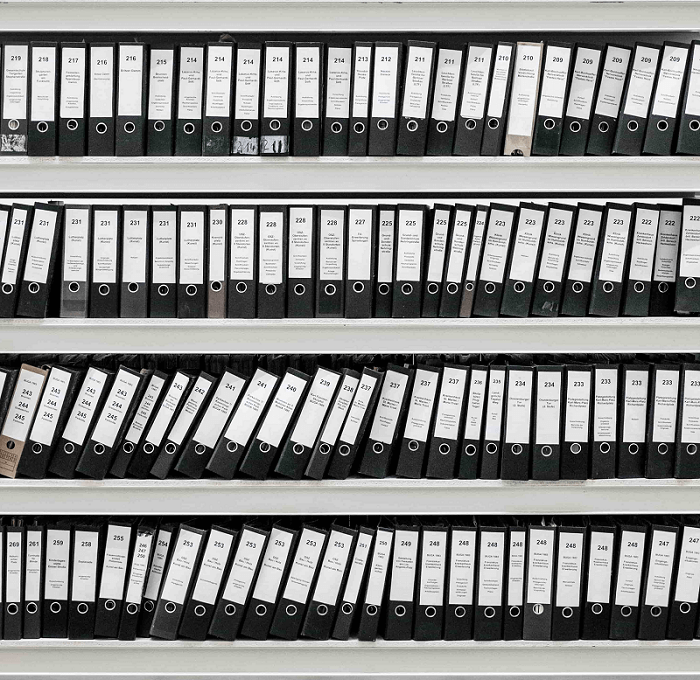 With so advanced tools available to marketers, it’s possible to automate lots of stuff that until recently have had to be done manually. 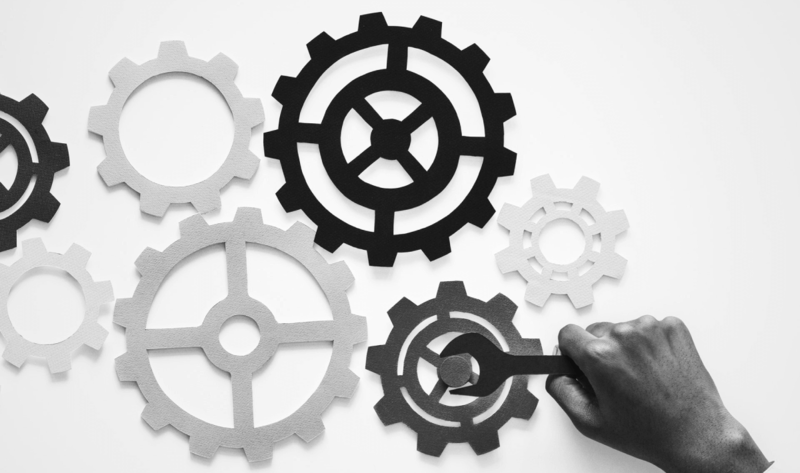 A great example of such a tool is the Marketing Automation platform and one of its main functionalities in particular – workflow. 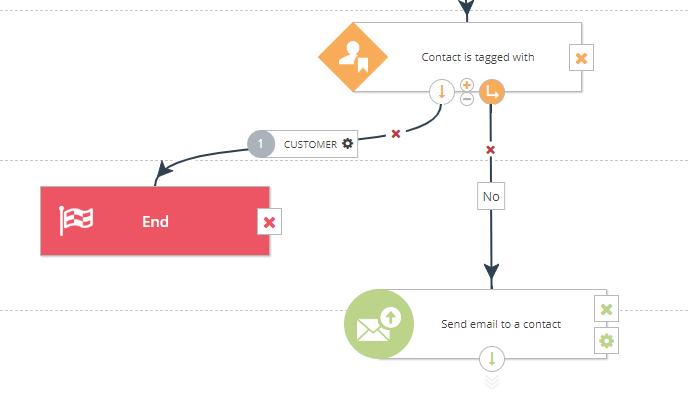 A workflow is an automated marketing campaign created on the Marketing Automation platform. This is a great tool to plan your marketing strategy and let it be done automatically by the system, without any manual action. It not only allows to save a good deal of time. Automation means taht way more data can be analyzed, and more actions can be performed simultaneously than could be carried out by a human. 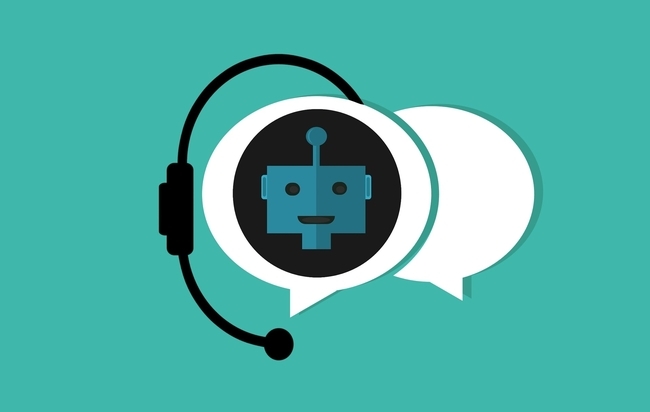 Another benefit of automated communication is a high level of personalization. The data gathered by the Marketing Automation platform regarding the behavioral and transactional profile of every user can appear to be useful when you want to adapt messages to preferences of a recipient. Workflow in all its glory! Sounds (or looks) complicated? Not at all. In SALESmanago Marketing Automation, workflows can be created easily and effortlessly in an intuitive, yet powerful drag&drop wizard. 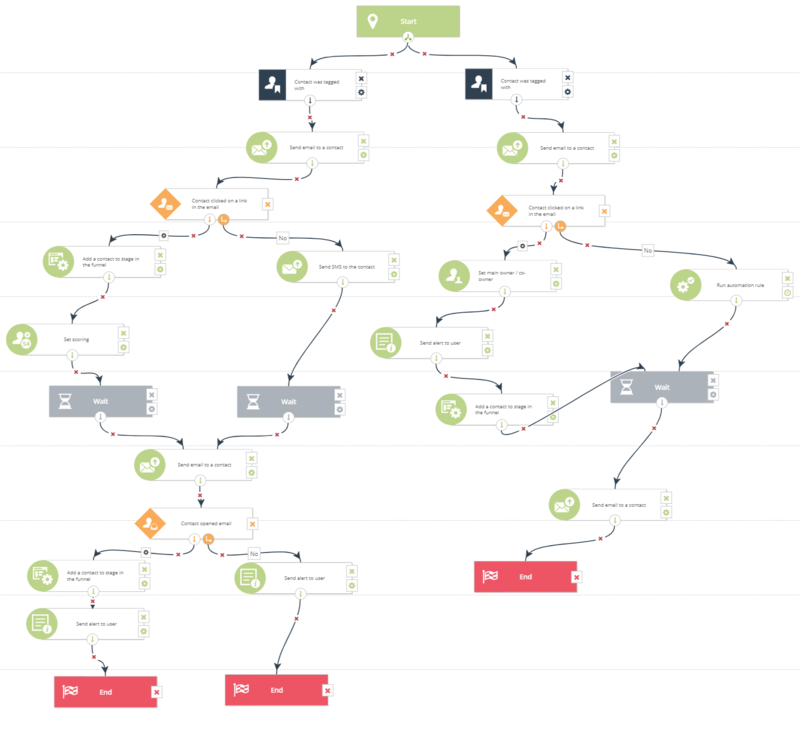 In order to show you how easy (and even fun) it is to create an automated marketing campaign, we have prepared this step-by-step guide that will lead you through creating an examplary workflow. Let’s kick off! 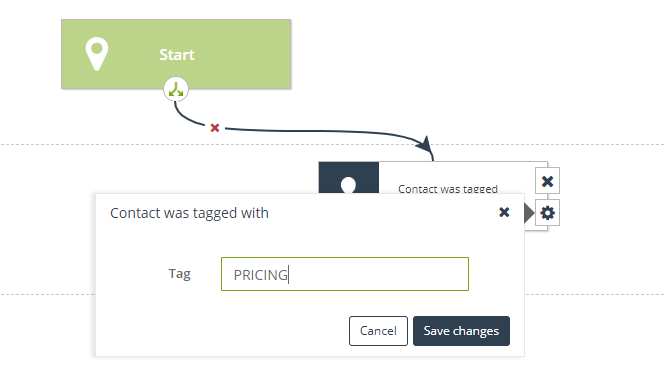 In this example, the campaign will be triggered when a contact is tagged with a specified tag. Tagging is a way of sorting contacts from your database into groups of similar interests in order to adapt the communication to their needs and requirements. There are many ways to assign a tag to a contact, for example, when the user visits a specific page on the website. In our case, let’s say it’s a tag called PRICING, assigned when a customer visits your pricing page. Visiting such a page means that the user is considering your service or product and is evaluating the options. It’s a great moment to start a conversation about your offer and start convincing your potential customer that you have exactly what he wants. What can you do when you know the visitor was sneaking around your pricing page? For example, you can send a message saying directly that you have registered his visit on your website and you are here to help him with any questions that the user might have. It may be the the potential customer’s first direct contact with your company, so make sure you make a good impression. 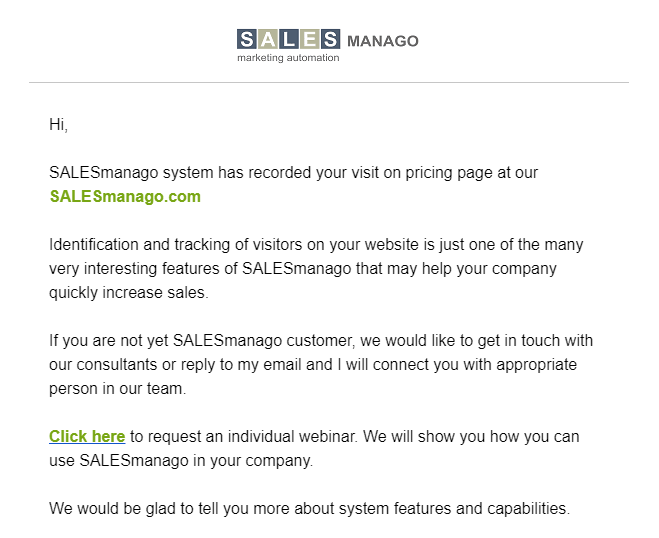 Take a look at the example of such email sent by SALESmanago after the contact visits the pricing page. Don’t forget about a clear call to action – what do you want your contact to do? What is the purpose of the email? Be clear and straightforward to avoid confusion of your potential customer. Why does this kind of message work? The user gets a feeling that he is being taken care of and his needs are met. It’s highly probable that he will also want you to lead him further in the sales process. Of course, you don’t want to send such a message to your current clients! That would be quite the gaffe. So while building your campaigns you need to specify if there is a group of users that should be excluded – in this case, your paying customers. You can do it easily by adding a “condition” element to your workflow before sending an email. It can be done once again thanks to tags. If the user is tagged with the CUSTOMER tag, the workflow ends for him in this place. But if the contact is not tagged with the CUSTOMER tag, i.e. he is not a client yet, he will receive the email. This is where things get a little bit more complex. You can now decide what actions you want to perform according to the user’s reaction to message no. 1. If he or she reads the email, then you can send the next one, for example explaining a little bit more about your product or service or perform any other action that would be the next level designed for more engaged recipients. If the message isn’t read, then maybe you should readjust your strategy. Maybe email is not the users’ preferred way of communication? You may try your luck by sending an SMS or a web push notification. We have said before that if your contact attempt doesn’t succeed, you can try on another channel again. But how to make sure which channel will be the right one? Everyone has their preferences. Guessing is not the right move here. Fortunately, we have A/B/X tests to save the day! The tests let verify which elements of the campaign will bring better results: a static or a dynamic email? a personalized banner or a web push, or maybe an SMS? The A/B/X test is the way to find out. 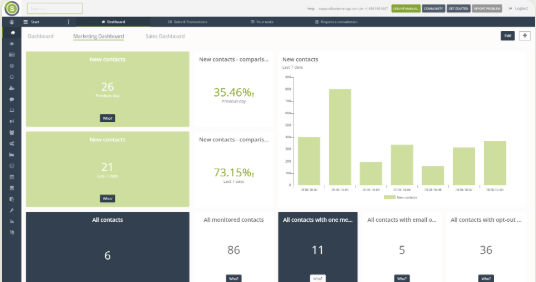 Workflow is not only a great marketing tool, but it is also a useful solution for managing and streamlining sales processes. Let’s say you want your sales reps to receive alerts about contact specific behavior: when he opens an email, visits a page, clicks a link, etc. You can also assign scoring to every contact for the desired activity. Scoring is a way to measure the engagement of the user – if he reads emails, visits the website, clicks on a banner, and therefore determine if he is ready to buy. All of these is possible thanks to Workflow. 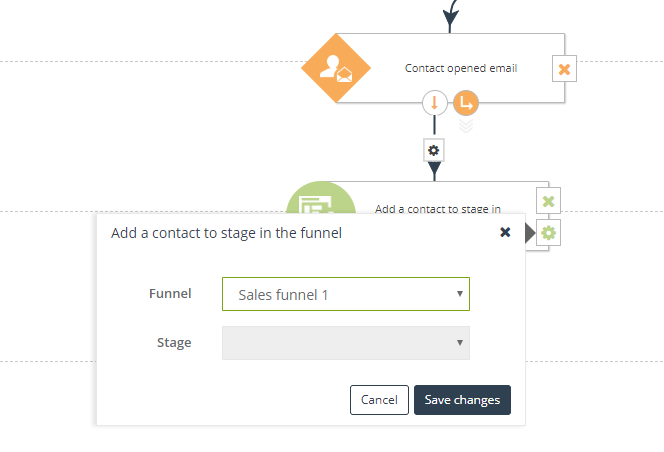 In our case, we want a contact to be moved to another stage in the sales funnel after he opens the email sent in the previous step of the campaign. The contact is now more informed about our company, so we want to move him to the PROSPECT stage. Thanks to this, your sales team will know that the user is potentially interested in your offer. Retargeting is a great way to stay in touch with your potential customers on other websites, for example on Facebook. The possibility to create a Custom Audience is an useful option. It’s a group of contacts which you want to see your ads on Facebook. 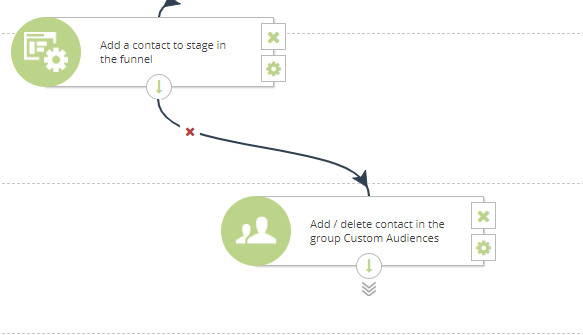 SALESmanago Workflow, thanks to the integration with Facebook Ads, gives you the option to add (or delete) contacts in your Custom Audience groups. 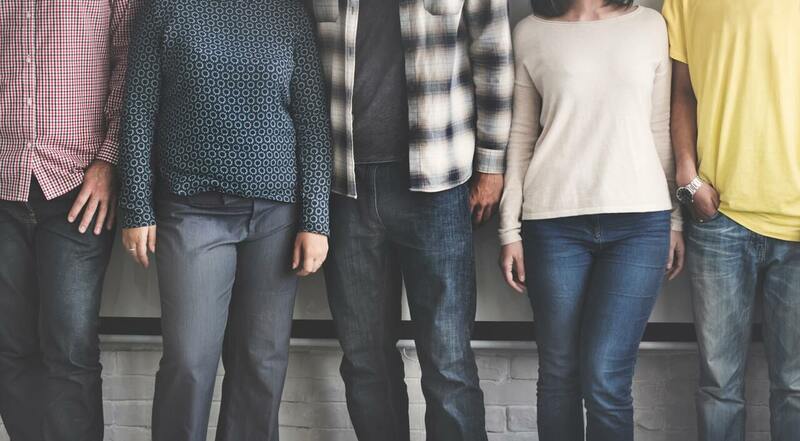 By retargeting you can strengthen the relationship with your prospects, increase your brand awareness and make your offer more visible and remembered. Now we just have to finalize the workflow with “end” elements and voila – our automated marketing campaign is ready! Our guide is of course just an example of marketing campaign that can be automated using Marketing Automation and workflows. Sky’s the limit – use your imagination and invention to create workflows that will help you achieve your own business goals!